AB Service caters to the needs for all types of Television problems in and around Coimbatore region. We offer professional servicing and repairs for your Television and are capable of dealing repair and restoration of High Definition Television (HD TV), LCD’s, LED’s and Plasma Television. We are known for our quality service in repairing LCD’s, LED and 3D Televisions. 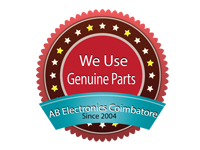 Our company has been running in Coimbatore with expert technicians who serve in the best interest of the customers. More than 10,000 quality services in LED, LCD computer monitors have been rendered by our company. Our technicians have the capability to diagnose the problems exactly and provide the best quality and timely service at affordable price. Quality service is our motto. We ensure that our repair and services comply with the quality standards. We ensure that only the genuine spare parts are replaced for your televisions. We are known for our expert service, attention to detail, quick turnaround, convenience and timely service. Step into our service centers and enjoy a one-stop solution to all your problems. Our engineers regularly attend continuing education courses to keep themselves informed on the latest technological advancements. We undertake all domestic and commercial services at any time. We offer our quality repair services in Tirupur and Pollachi region. We will be at your doorsteps to attend your service call in the shortest time.